Retails sales plunged 1.2 percent in December, shocking economists who expected a 0.2 percent gain. The report immediately raised new fears of recession, but economists said the report is also so negative against other more positive data, that it appears suspect. Even so, economists are slashing fourth quarter GDP growth estimates, and also keeping a wary eye on jobless claims, which showed a slight increase for a third week in a row. The drop in sales raised new concerns about the consumer, which accounts for more than two-thirds of the economy. The sudden and unexpected plunge in December's retail sales data raised new concerns about a recession, but economists also say the biggest drop in nine years clashes with other data and may be suspect. But nonetheless, Wall Street still took the data seriously and economists slashed fourth quarter GDP forecasts. JP Morgan cut its growth estimate to 2 percent from 2.6 percent. "This literally came from out of left field… I thought January would have been bad," said Chris Rupkey, chief financial economist at MUFG Union Bank. "All our reports earlier were that holiday sales were sparkling." The Commerce Department said retail sales for December fell 1.2 percent, the largest decline since September, 2009 when the economy was exiting recession and shaking off the financial crisis. The report was delayed due to the government shutdown, and there is no release date for January sales data. The report was expected to show a 0.2 percent gain in retail sales, and Swonk says it is subject to revision. Excluding automobiles, gasoline building materials and food, the core retail sales fell 1.7 percent, after a revised 1 percent jump in November. According to the report, December online and mail-order retail sales actually fell 3.9 percent, the biggest drop since November 2008, after increasing 2.8 percent in November. Even though the report looks suspect, economists were not dismissing it outright, as there were factors in December that could have weighed on consumers, like the sharp and violent drop in the stock market in a month that usually sees stock market gains. The 35-day government shutdown also began in late December and ended Jan. 25, but it is more likely to have impacted sentiment than actual retail sales, at least in December. The data also conflicts with other reports of holiday shopping, including Mastercard SpendingPulse, which said holiday sales rose 5.1 percent from Nov. 1 to Dec. 26, the best in six years, and online sales rose 19.1 percent. "It could be a reaction to the stock market…the lesson from that is stocks recovered and we're looking pretty good. Maybe we can come back from this, but it will be critical to see what happens with the Trump administration negotiations with China. We can't take another blow. The market and now Main Street can't take the uncertainty coming out of Washington," said Rupkey. "This is not just a pot hole. It is a major roadblock on the way forward. It really makes us question the outlook this year." During December, Fed officials also added to the uncertainty. They raised interest rates on Dec. 19, and Fed Chairman Jerome Powell indicated the Fed would continue on its policy path to shrink its balance sheet. But that spooked an already uneasy market, and Fed offiicials soon reversed course, and started sending signals that they could pause rate hiking, something that was reinforced in the January post-meeting statement. Adding to the dismal news in retail sales Thursday, weekly jobless claims rose for the week ending Feb. 8 fell by 4,000 to 239,000 the third consecutive week of gains after hitting a 49-year low on Jan. 19. Jobless claims are watched even more carefully than monthly employment reports since they are the most current data available on the labor market. "It is harder to blame lingering shutdown effects or the L.A. teachers strike for this morning's figure, and the move up in the four-week average to 232,000 lends further weight to the notion that the job market may be cooling after the very strong January employment report," wrote JP Morgan economists. "It's obviously creating recession fears, but the dirt is always in the details, and the details are not as bad as the headline number. These markets have been complacent lately," said Swonk. "It's amazing what a hair trigger they've been on, to go in either direction. That underscores the idea that there's uncertainty about the year ahead, which is mostly political and trade related, and geopolitical. It's basically like walking on egg shells." Consumer confidence fell in both December and January, and the January decline was blamed on the temporary effect of the government shutdown. But that does not explain December's abrupt retails sales drop. "Part of the problem is the government shutdown. We had a data void, and now we're getting data in that was lagged. Everyone was euphoric that December was a good month, for big box retailers. Traditional retailers not as much," Swonk said. She said the data showed softness in leisure, yet restaurant hiring was strong, "That was a surprise given what we've seen in food service." "The bottom line on this data release is that it is truly dreadful pretty much across the board. 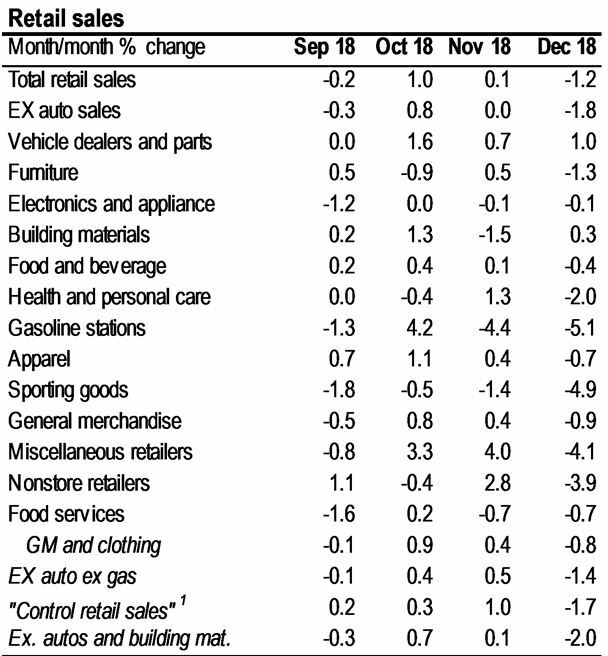 Taken literally, this data release would indicate that the consumer sector collapsed in December. This release is such an outlier and so incongruous with the general trend in consumer spending, holiday consumer sales reports and holiday seasons consumer credit data that it does raise suspicions of data reliability," wrote Ward McCarthy, chief financial economist at Jefferies. McCarthy said the government appeared to dismiss the issue in its statement, by noting that the data collection was delayed due to the shut down but that "processing and data quality were monitored throughout and response rates were at or above normal levels for this release." "In the context of the government shutdown and delayed data collection, we still think that some suspicion is warranted," he noted.